Comedian George Carlin is known as one of the most controversial and outspoken entertainers of his time, and as far as the government is concerned, he could have possibly been a terrorist. Carlin was not a violent or criminal person in any way, but he said things during his routines that struck at the root of the problems in our society. He went into great detail about corruption in government and business. 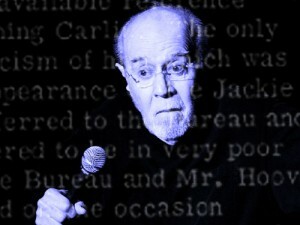 During the 1978 Supreme Court case, FCC v Pacifica Foundation, the government cited Carlin’s work as an example of profanity. They used his ‘Seven Dirty Words’ segment to show the type of language that was being used in records and broadcasts. However, the government’s interest in his work did not stop there. This post was published at The Daily Sheeple on August 20th, 2015.